With this year’s donation of more than $32,000 in books, the Long Beach Rotary Charitable Foundation will have provided about 200,000 books to local students and school libraries since 1999. Rotary has collected contributions to this cause at its meetings, gathering more than $300,000 in donations and matching funds for the literacy effort over the years. Local preschoolers recently thanked Long Beach Rotary for its donations, including more than $7,500 in books for the Long Beach Unified School District’s Child Development Centers. One by one, preschoolers at the West CDC selected a new book to keep, wrote their name in it, and then read to a Rotary member. This year’s donated books also are going to children at the school district’s popular Kindergarten Festivals. The next festival is 9 a.m. to noon Saturday, March 31 at Mann Elementary School. See lbschools.net for details. The donated books also will be used to stock several elementary school libraries and classroom libraries such as those at Edison Elementary School where Rotarians frequently read to students as part of the Rotary Reads program. Heading the Rotary effort each year is Poly alum and attorney Frank Newell. Long Beach Rotary is the city’s oldest and largest service club. 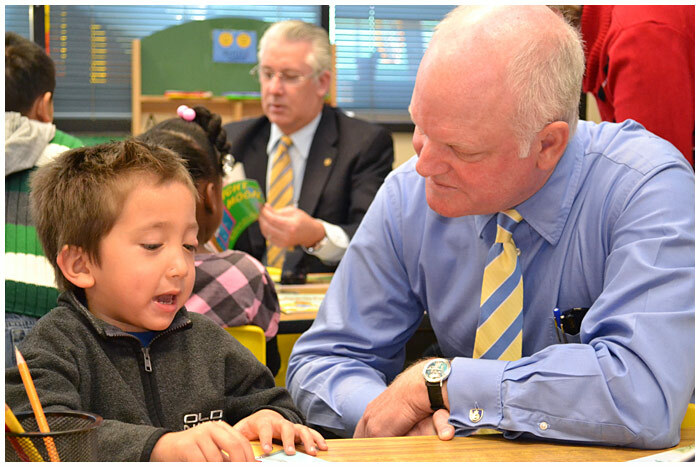 GIFTED -- Preschooler Carlos Morales reads a new book to Rotary member Brian Russell at the West Child Development Center. Preschoolers thanked Rotary for donating more than $7,500 in books. In the background is Rotary President Blake Christian.